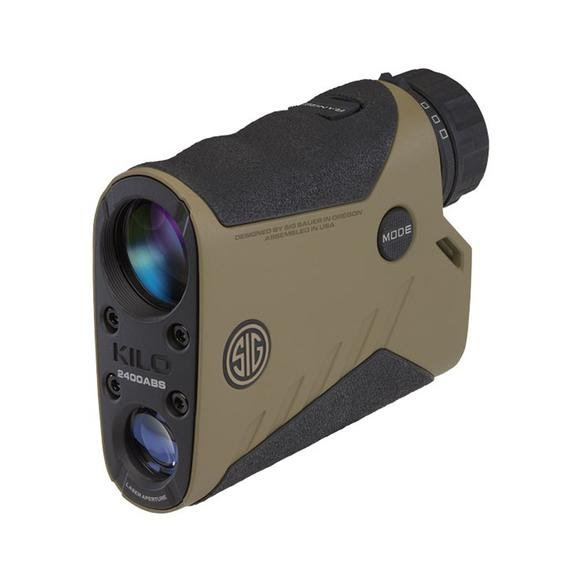 The Sig Sauer KILO2400ABS is the world's most advanced rangefinder that ranges up to 2 miles featuring an embedded Applied Ballistics calculator, onboard environmental sensors and Bluetooth for synchronizing custom profiles with a free, downloadable ballistic app for your iOS or Android smartphone. The Sig Sauer KILO2400ABS is the world&apos;s most advanced rangefinder that ranges up to 2 miles featuring an embedded Applied Ballistics calculator, onboard environmental sensors and Bluetooth for synchronizing custom profiles with a free, downloadable ballistic app for your iOS or Android smartphone. Includes a tripod adapter, smartphone jack WindMETER, ballistic nylon Molle kit bag and nylon carry pouch, lanyard, 3 spare batteries, and SIG SAUER Tactical pen/stylus to get you up and running for long range precision target shooting and hunting. Ranges up to 2 miles with the Revolutionary LightWave DSPTM Technology for the fastest and longest distance rangefinder engine. Free downloadable SIG Ballistic App for your smartphone. iOS and Android are supported. Build, edit, and upload from the app to your device. Digital Compass / Magnetometer / Inclinometer provides magnetic heading and incline for long distance shooting and Coriolis adjustment. Line of Sight or Angle Modified range in addition to full ballistic holdover and windage results in MIL or MOA. Sensor Override: Ability to override the current sensor readings and input your own parameters such as Temp, Pressure, Direction of Fire etc. KILO2400ABS syncs with a smart phone via the Applied Ballistic&apos;s Ballistic Solver app. Calculating long-range rifle trajectories for the perfect shot. Lightwave DSP (Digital Signal Processing) engine leverages HyperScan - an advanced power management technique that provides the fastest refresh rate in scan mode (4 times per second) even at distances over a mile. AMR is advanced ranging technology using an on board inclinometer that reads incline/decline angle and modifies the effective ballistic shooting range to the target.